My Life in the Ragtrade is the story of the famous Australian brand names, many developed from humble beginnings yet made in clothing factories employing thousands of people, and the grand retail stores and clothing shops that stocked those brands. 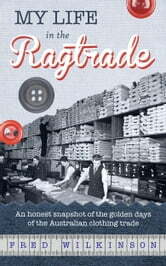 In My Life in the Ragtrade, author Fred Wilkinson takes us on a trip back in time to the days of Sidney Myer&apos;s beginnings in Bendigo, to Flinders Lane, Melbourne (&apos;The Lane&apos;), travelling salesmen and hawkers, and names and slogans which we&apos;ve all but forgotten: Anthony Squires, Sutex, Keith Courtenay, Pelaco, Crestknit, Chesty Bond, Love Me in my Glo-Weave, Hard Yakka, He&apos;s so good he thinks he&apos;s King G, and more. Then there were the retailers - Winns, Farmer&apos;s, Anthony Hordern, Mark Foy and more. Shopping back then was an adventure, it was a pleasure to be served and customers were treated like royalty. Come, join Fred on a walk down memory lane through Australia&apos;s rich textile, fashion and retail history.